This 5 position controller is designed to power our gloves and socks. Features built in leads for connecton to gloves or socks. Operating Voltage 6-18V. Short Circuit and Reverse Polarity Protection. 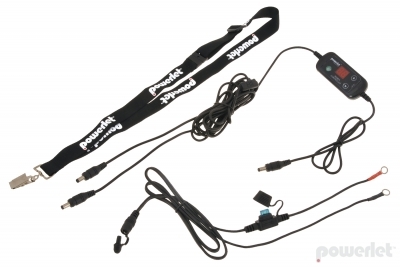 Complete with battery harness and Powerlet® Lanyard. Our Performance line of temperature controllers are designed to be fault tolerant. These controllers will not fail in wet weather. Being fully protected against reverse polarity, overload and short circuits, Powerlet Performance(tm) Temperature Controllers are designed to perform under all conditions.